Danny Kent becomes the first British rider to take back-to-back wins in the lightweight-class since Barry Sheene in 1971. Circuit conditions had changed from qualifying at the Termas de Rio Hondo, with grey clouds replacing the sunshine and a much lower track temp of 30 degrees, but not even this could stop Kent from claiming his second win of the season. Leopard Racing’s British rider disappeared off into the distance after taking the lead on the 3rd lap, lapping almost a second faster than the rest of the pack to take the race win by over 11 seconds, in a repeat of his dominant performance from Austin. 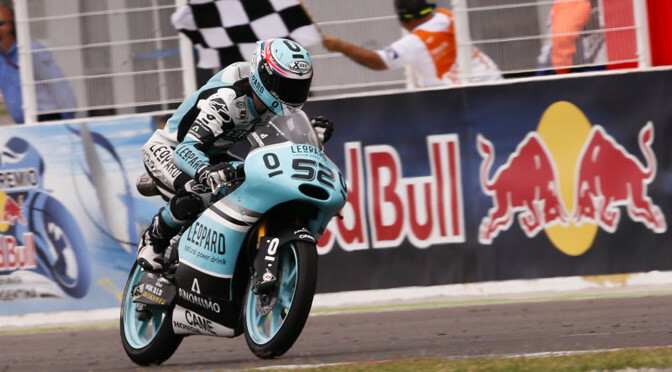 This meant that everyone else was battling it out for the remaining two podium places, with Kent’s teammate Efren Vazquez making it a Leopard Racing 1-2 in Argentina, after an excellent final lap scrap with the Husqvarna Factory Laglisse of Isaac Viñales. Pole-man Miguel Oliveira on the Red Bull KTM Ajo machine was 4th, ahead of his teammate Brad Binder, and the Estrella Galicia 0,0 rookie Fabio Quartararo in 6th. Karel Hanika finished in 7th, with Romano Fenati having to come from the back of the grid after an incident during Warm Up to claim 8th. Enea Bastianini and Niklas Ajo rounded out the top ten in 9th and 10th respectively. Danny Kent now has a seventeen-point lead over his teammate Vazquez after just three races in the Moto3™ World Championship standings.